1999-2009 Yamaha V-Star 1100 whaletail tank bibs! 2007 Yamaha V-Star 1100 Classic whaletail tank bib with “Biker at the Cross” hand tooled & colored artwork & metallic silver buckstitch lacing stripes. Bill Me Later is now being accepted! 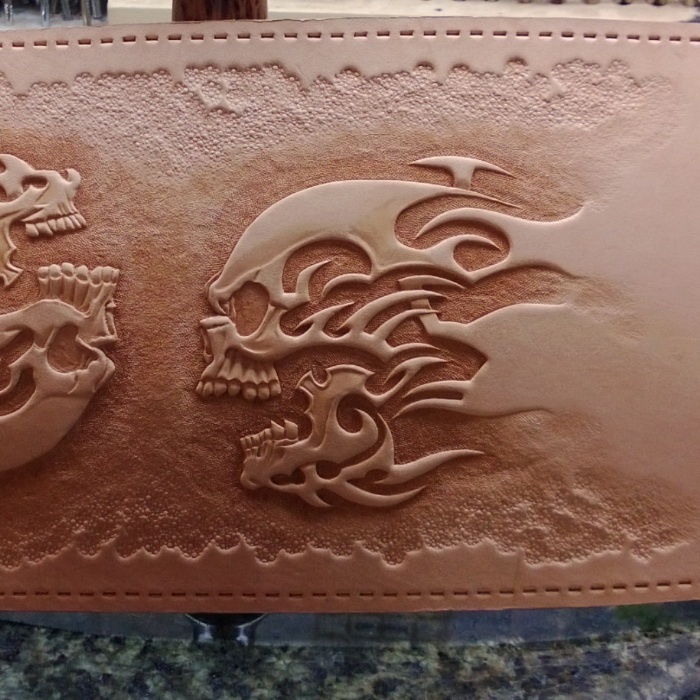 I noticed over the past few months, some search engine search results for “custom leather shop that accepts Bill Me Later”. Well, I looked into it and it’s an available part of Paypal business accounts and all I had to do was turn it on! So, I’m pleased to announce that there is a finance option available for those folks that were looking for it. It is a standard paypal payment option so to use it, request the Paypal invoicing option when placing an order. July and August brought me a pair of movie themed bibs, Terminator 2 and Batman: Dark Knight Rises. Both were fun projects with their own challenges especially since both images have been seen the world over by millions, so they had to be top notch. 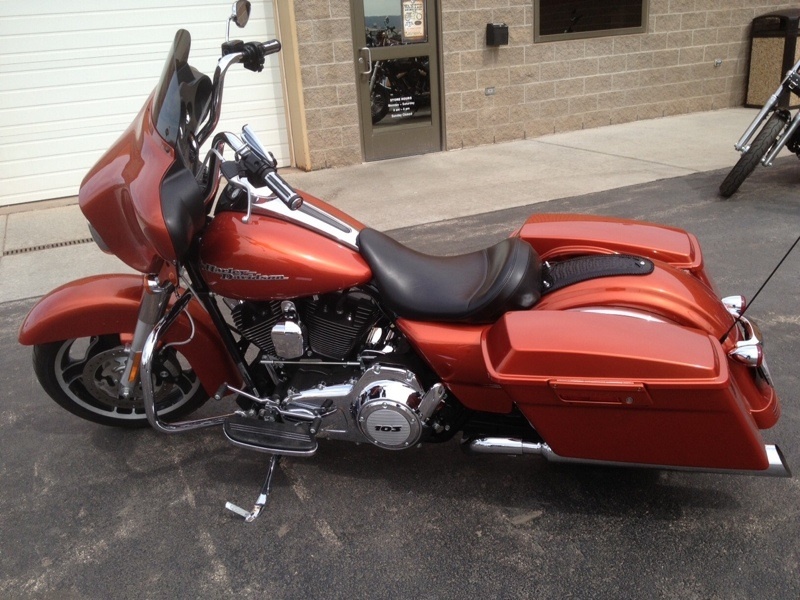 First up was Terminator 2: Judgement Day for a 2002 Harley Davidson Fatboy. 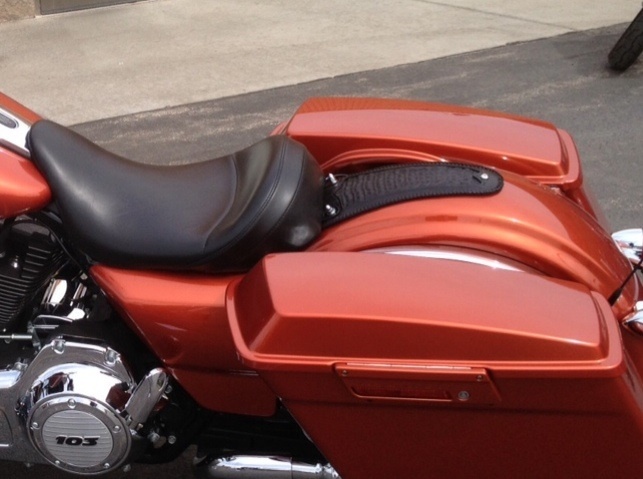 Not only was the image large and to be in color but as I found out during the process, the pattern for the Fatboy changed in 2005, not 1997 like the Road Kings and Dynas. Combine that with my confusing the tag lines from T2 and T3 and this bib ended up being made 3 different times (fortunately only up to the raw tooling stage) to make sure it was right. As I write this, the bib is finding it’s way to the client in Great Britain so installed pics will be a few days yet. 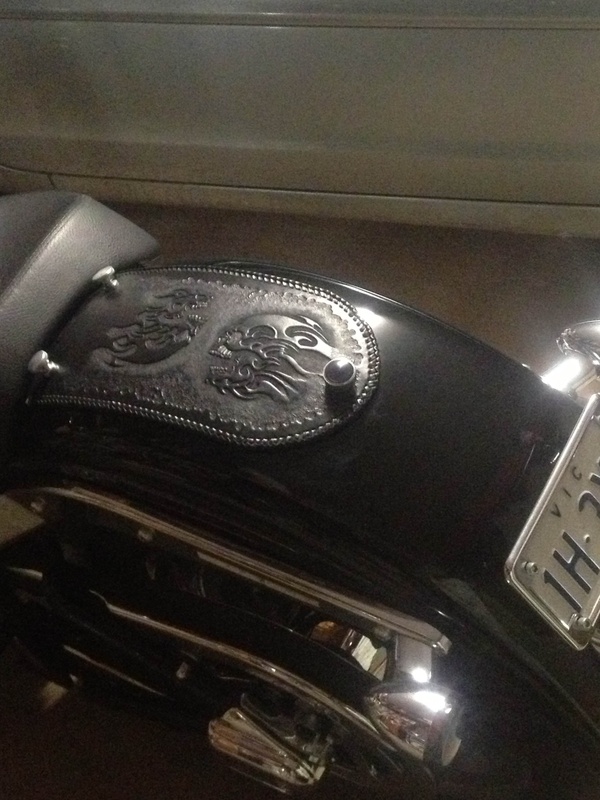 The second movie themed fender bib was Batman: Dark Knight Rises for a 2011 Harley Davidson Blackline. 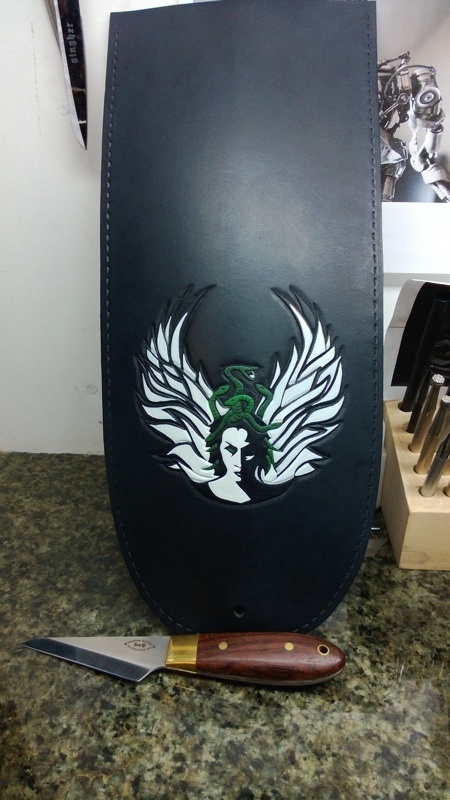 I had previously made a fender bib (Black Swan) and tool bag set for the client but he was considering changing the theme. While discussing ideas, he saw a picture on Facebook of my daughter playing with a Batman toy and inspiration hit him. We went with the skyline overhead explosion from the movie posters & DVD box as the perspective and detail were perfect for a fender bib. 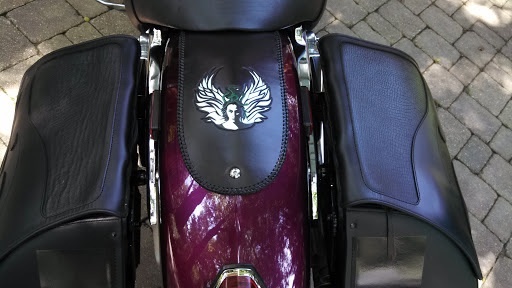 I have a bunch of new custom leather project & bike pics to share this week but some of them need their own post or a themed post so I’ll just start with a couple of recent custom rear fender bibs I made for two Harleys and a Honda…enjoy!